ANTIGONISH, Nova Scotia, Canada (August 17, 2013) – Jason Hathaway snapped a 59-race winless streak, claiming victory in the Wilson Equipment 300 Supporting Red Cross Disaster Relief on Saturday in NASCAR Canadian Tire Series presented by Mobil 1 action at Riverside International Speedway. The Dutton, Ont., driver took the lead on Lap 295 of the 300 lap event from Scott Steckly, who won the pole position earlier in the day, and survived strong competition from defending series champion D.J. Kennington and Steckly to earn his second career series win. His previous best finish at the track was fifth, achieved in the 2010 Antigonish event. Kennington narrowly missed his second win of the season by just .342 seconds, settling instead for a second-place finish. Steckly finished third for his fourth consecutive top-five finish at Riverside. Mark Dilley and Martin Roy rounded out the top five. Seventeen-year-old rookie Alex Guenette recorded his fourth top 10 of the season with a sixth place finish while Donald Chisholm, Noel Dowler, Hugo Vannini and Trevor Seibert completed the top-10 finishers. The victory was a present for car owner Ed Hakonson, who was celebrating his 64th birthday on Saturday. 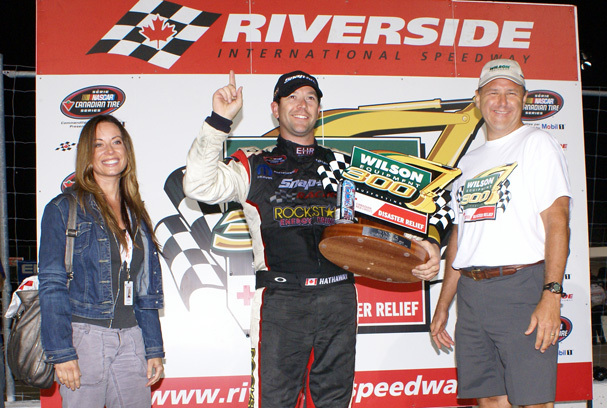 Hathaway’s last series win came in the Sept. 2008 season finale at Kawartha Speedway near Peterborough, Ont. The race was slowed due to caution six times for a total of 52 laps and the race lead changed hands seven times among six drivers. In the championship point standings with just three races to go in the season Steckly maintains a four-point advantage on Kennington while Hathaway closed to within just 10 points of the leader. The event celebrated its inaugural affiliation with Canadian Red Cross Disaster Relief with an $18,000 donation in support of the emergency preparedness division. The Wilson Equipment 300 will premiere on TSN at 1 p.m. ET on Sun. Aug. 25 and on RDS2 at 7 p.m. ET on Fri., Sept. 13. The NASCAR Canadian Tire Series presented by Mobil 1 continues the season with the Pinty’s presents the Clarington 200 on the road course at Canadian Tire Motorsport Park near Bowmanville, Ont., on Sept. 1 in a date shared with the NASCAR Camping World Truck Series which will be racing in Canada for the first time. 1. (7) Jason Hathaway, Dutton, Ont., Dodge, 300 laps, 54.318 mph. 2. (5) D.J. Kennington, St. Thomas, Ont., Dodge, 300. 3. (1) Scott Steckly, Milverton, Ont., Dodge, 300. 4. (12) Mark Dilley, Barrie, Ont., Ford, 300. 5. (2) Martin Roy, Napierville, Que., Dodge, 299. 6. (10) Alex Guenette, Terrebonne, Que., Dodge, 299. 7. (3) Donald Chisholm, Antigonish, N.S., Ford, 298. 8. (6) Noel Dowler, Sherwood Park, Alta., Dodge, 298. 9. (15) Hugo Vannini, Repentigny, Que., Ford, 296. 10. (13) Trevor Seibert, Williams Lake, B.C., Dodge, 293. 11. (17) Ryley Seibert, Williams Lake, B.C., Dodge, 289. 12. (16) Ray Courtemanche Jr., Montreal, Que., Dodge, 289. 13. (11) Larry Jackson, Oakville, Ont., Dodge, 233. 14. (14) Jason White, Sun Peaks, B.C., Dodge, 226, mechanical. 15. (8) Ron Beauchamp, Jr., Windsor, Ont., Dodge, 202. 16. (4) J.R. Fitzpatrick, Ayr, Ont., Chevrolet, 167, engine. 17. (9) L.P. Dumoulin, Trois-Rivieres, Que., Dodge, 116, mechanical. Caution Flags: 6 for 54 laps. Lap Leaders: S. Steckly 1-94; J. Fitzpatrick 95-166; S. Steckly 167-172; D. Chisholm 173-184; M. Dilley 185-188; D. Kennington 189-192; S. Steckly 193-294; J. Hathaway 295-300. Standings: 1. S. Steckly, 351; 2. D.J. Kennington, 347; 3. J. Hathaway, 341; 4. L.P. Dumoulin, 319; 5. J.R. Fitzpatrick, 310; 6. M. Roy, 310; 7. N. Dowler, 288; 8. R. Beauchamp,Jr., 284; 9. J. White, 284; 10. T. Seibert, 280.